I’m reposting my Organization 101 post from last week so I can take part in Andrea’s “Show and Tell Tuesday” today! I LOVE to be organized. Now that I have two kids, I’ve really had to fight to keep everything organized. In 2013, we moved from a two-bedroom apartment to a four-bedroom house. It seemed like we had so much space, we would never fill it up. Guess what. . . it’s full. :) I am always trying to declutter. I find joy in throwing or giving things away. Less is truly more. Here are SEVEN of the ways that I like to keep organized. A few of them are NEW methods that we’re implementing in our house. I really think that they are going to add a lot of peace to our chaos. Mine is really simple—just one big chore per day. Our dog sheds terribly, and we could stand to vacuum constantly, but I often forget to! Similarly, I can never remember the last time we cleaned the bathrooms. I designated each task to be completed on certain days of the week, and I placed the chart in a spot that I see often (the fridge). Have you ever noticed that as soon as you put something down on the counter, it attracts more things to collect there? I have been the worst at letting my counters get out-of-control, and then I face some anxiety every time I walk into the kitchen. Too much clutter! Our kitchen functions as our mudroom too, so it is an easy dumping ground. But we’re going to try and have a place for everything—and be consciously leaving the counters free and clear! We used to collect all kinds of free shelves until we realized that they weren’t functional for us. The kids would pull everything down off of the shelves, so we couldn’t style or decorate them. And we needed space to hide things like cords, remotes, craft supplies, and other random things that needed homes without having to be seen all the time. Dressers are the perfect solution! We have this one in our living room—and it fits well. I realize not everyone can relate to this—but we have excellent storage space in our house. We have a bench that opens up in our entryway, and we use it to store all of our shoes. I also keep a section inside it for recycling catalogs and other papers right after I check the mail. We have a really nice coatrack in the entryway. It was starting to collect junk, but recently, I designated each of the cubbies for the four of us. We can store hats, mittens, and sunglasses in them. Like the bench in the entryway, our window seat opens up as well. This week, we took out a bunch of odds and ends and filled it with the boys’ puzzles and games that they don’t play with every day. I use a diaper bag that has ample pockets on the outside and inside, and I memorize what each one is used for. I even keep little bags inside of the big bag so that I don’t have to be digging too much for things like lipstick or pens. This is a system I’ve been fine-tuning: utilizing two boxes to sort papers that need dealt with. For instance, in one box, I store bills, to-do lists, letters that need responded to, and other projects that I’m working on. I typically need to look through this box every day. I keep a second box for things that I want to keep and refer to later, like coupons or design work I’ve done in the past. I have a file folder that I use specifically for bills (I pay them once a month). As soon as the bills are paid, I move them upstairs to a permanent place in our filing cabinet. I have so many thoughts and ideas that flow through my head throughout the day that I have to keep paper near me at all times. I typically carry one notebook that I can write everything in (otherwise I have a million Post-Its and slips of paper to keep track of.) I also have a wall calendar so that I don’t forget what’s going on each week. I hope you were able to glean some new organizational tips from me today! 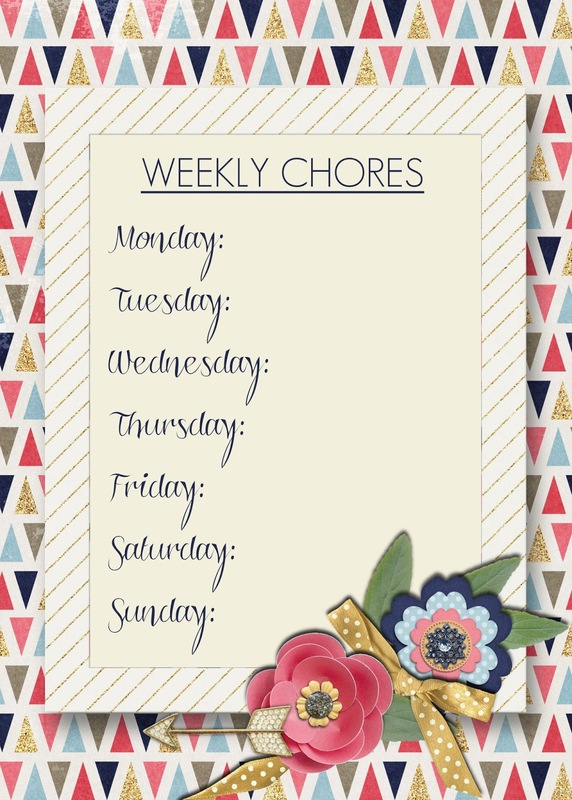 Love the chore chart and the idea to do one thing a day! I might just have to do the same! Thanks! LOVE these tips!!! My organization has also gone downhill since having kids! I need to get a coat rack/cubby for our laundry room/mud room! That chore chart sure makes chores look like fun! I am also trying to do one big chore a day. I want to take back our weekends. Love you built ins. I love your Vera diaper bag! !